Perhaps NBC wishes they could time travel right about now. 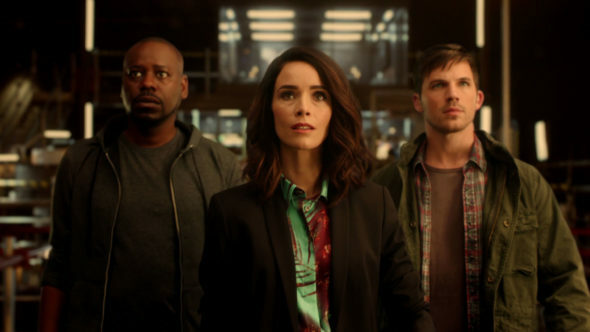 According to The Hollywood Reporter, the network has been denied dismissal over a lawsuit regarding the TV series Timeless. Now, a California federal judge has denied NBC and Sony’s motion to end the lawsuit. What this means for the future of Timeless is unclear. The show’s freshman season has performed okay in the ratings so far, earning an average rating of 1.12 in the 18-49 demo and 4.707 million viewers. But will the pending lawsuit ensure the show’s cancellation? NBC has not yet announced whether or not the series will be renewed. The season finale of Timeless airs on February 20th. Love the show please bring it back. Learn interesting things every episode. Timeless is a cleaver show. It’s nice to see a show that goes back in time. People today have lost interest in our history. I really hope this show will be renewed and I think it may peak the interest in younger people to learn more about the history of our great country. Come on season 2! I am fascinated with all things time. I believe that history is almost infinite and the possibilities of creating a show surrounded by it, would be priceless. I definitely want to see a second season. I would love to see this series prosper into a full franchise of five or more seasons! True imagination comes from inspiration. And with a subject so incredible (like time), one can only dream of all the possibilities!! I can’t wait to see the next season! I crave more! It’s u fortunate this has tainted the show. I agree with Sony–the first movie to establish the premise here (chasing someone who threatens another time )was “Time After Time” (the 70’s movie). The premise is also used for “Frequency” except there the series does involve changing the past. The whole Rittenhouse plot is u ique to the show. These ideas are pretty common. I work 2nd shift so I cannot see it when it is airing so I see it either on Hulu or NBC.com, it is sad that they only pay attention to a certain age group, I am 57, so they just forget about us. Pathetic. I agree. I am 53 myself and it seems like they could care less about us. Timeless had so much promise but the writing is terrible and the weekly outcome is predictable and the details that lead you to the same outcome aren’t interesting enough to warrant more of this painful, awful series. Please cancel this and bring on something more imaginative and with better writing. One of the best shows on TV. I hope it comes back for season two. Absolutely LOVE this show: it’s smart, it’s suspenseful, Garcia Flynn is such a great villain — but if the lawsuit messes up the renewal, I’m going to be very, very disappointed.